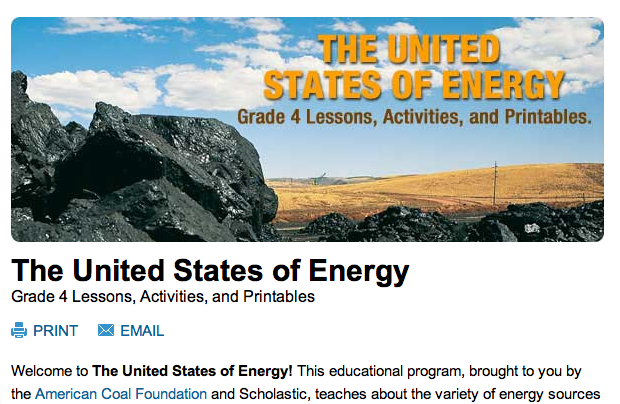 Scholastic, Inc., a leading publisher and distributor of children’s books and teaching materials, agreed to stop selling a coal industry-sponsored curriculum that it has distributed to 66,000 fourth grade teachers since 2009. The curriculum was sponsored by the American Coal Foundation, which represents the interests of the coal mining industry. A May 11, 2011 New York Times story labeled the coal industry-created curriculum “unfit” for fourth graders because it failed to mention the negative aspects of coal mining and burning on human health and the environment, like removal of Appalachian mountaintops, toxic waste discharge, sulfur dioxide, mercury and arsenic discharges, lung disease and mining accidents. The Campaign for Commercial-Free Childhood, which drew attention to and opposed Scholastic’s use of the curriculum, has also opposed Scholastic for its “SunnyD Book Spree,” which the company featured its Parent and Child magazine that encouraged teachers to have classroom parties with Sunny Delight, a sugar-fortified drink, and collect labels from the beverage to win free books. The campaign has also objected to Scholastic’s promotion of Children’s Claritin in materials it distributed about spring allergies. Scholastic is a $2 billion business whose educational materials are in 9 of 10 American classrooms. For information about efforts in West Michigan to challenge corporate-funded educational materials in schools contact the group STOK. It’s incredible to me that some educational publishers are still getting away with this kickback scheme. It’s one thing to team up with another educational concern–like Children’s Television Workshop or one of the educational software companies–to do co-sponsored projects. It’s quite another to release advertising and the “sanitizing” of some industries into the schools. The best way to fight this is by a state law prohibiting any advertising in materials sold in a given state. California has a very effective law on the books. We need one here in Michigan that has real teeth. Educational publishers would be forced to develop mainstream materials that are advertising- and sponsor-free, and would not be allowed to flog this kind of crap in the state if we had a law to block them from doing so.